There is nothing as magical as the creative energy that women in the arts possess. Put a few dozen of those women in a room, or perhaps, a theater together and the atmosphere is positively other-worldly. Such was the case on March 23rd, at the renowned A Noise Within Theater in Pasadena, Ca. In an event sponsored by the Los Angeles Female Playwrights Initiative and Noise Now, some of LA’s talented female playwrights came together to celebrate the 12th Annual Swan Day. Guests were welcomed by a most enthusiastic host, Jenny Webb, and treated to a spread of wine and crudité. Webb’s excitement was palpable and I was immediately taken by the occasion. 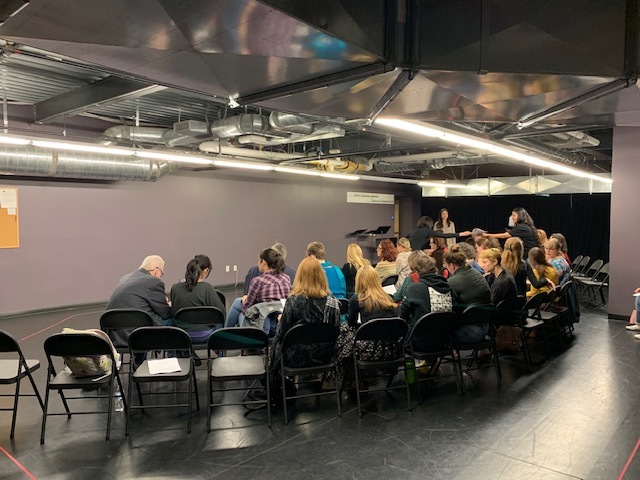 The lobby of the beautiful theater space was populated by a couple of dozen actors and directors, all preparing for the main event which consisted of a series of micro reads and a few 10-minute play performances. Most of the material was, of course, written by women. The buzz in the room was intoxicating, making the wine unnecessary, but still a nice touch. An afternoon with a little rosé and some independent theater is my kind of day. Adding to the thrill was the sheer ratio of women to men, being about 5:1. Watching these women quietly but intensely work through the words on the page was enough of a compelling show for the likes of a freelance reporter. The whole thing could have been quite a powerful cinema verité sort of documentary. To observe women eagerly giving voice to their peers’ poetic work inspired me to the core. And as an audience member, watching the process was just as captivating as watching the product. It is important to note that the marriage of LAFPI and Noise Now is a new and promising one. 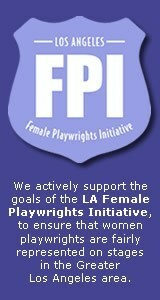 LAFPI is an incredible organization dedicated to raising the voices of female playwrights in the world of theater. When the comprehensive Sands Study about gender parity in theater was published, its findings rocked the theater world. The gender bias in theater had always been obvious to women who labored to get their work recognized, but now the bias was backed in a scholarly fashion, making it an undeniable reality. As a result, a powerful group of women artists banded together with a single mission in mind: to correct the deficit. The LA chapter of FPI has done incredible work in building a network of artists who help to support one another in their career paths. Noise Now is a new division of A Noise Within that works to engage with artists in the community and diversify the work that is available to the public through their organization. The mission of Noise Now is to : “illuminate and activate underrepresented populations, communities of color, young people, and all others not equitably represented at the theatre”. A perfect way to meet that mission is to offer support to groups like LAFPI and to highlight and celebrate SWAN DAY! I got that feeling that it is a partnership that will grow and thrive in the years to come. After the initial reception, the group headed downstairs to a wonderful space that is primarily used for rehearsals for A Noise Within’s mainstage shows. The space was indicative of an upscale NYC loft, industrial, wide, yet intimate, and alive with creative energy. As the series of micro reads commenced, I was struck by the notion that no one person ever looks like the stories they have to tell. It is impossible to know what a single person has inside of them just at a glance. The single page selections were submitted in the morning and given a short time to rehearse before they were presented. Each piece was delivered beautifully and it struck me that they all seemed to stand alone, without introduction or backstory. I was suddenly disappointed that I hadn’t had the notion to bring my own page along with me. These women had all written deeply personal, intimate, and sometimes funny pieces, all worthy of being showcased. Most impactful was that there was an unintended thematic thread; the idea that women were asking to be heard. Ali MacLean, Camra Godwin, Deidra Edwards, Esther Mira, Livia Trevino, Miles Berman, Rati Tripathi, Renee DeBevoise, Richard Horvitz, Risdon Roberts, Sarah Hunter, and Syn Fontes. Additional hybrid micro reads were presented written by Leelee Jackson. The entire program was received with love and enthusiasm and was truly a tribute to the spirit of Swan Day. My only hope is that this event will grow exponentially over time. Where there were dozens of women sharing important and provocative stories, there should be many, many more. These stories were all worth a look and a listen. Not to mention the stellar performances that I witnessed that day, or the capable direction by some truly talented ladies. As the spirit of Swan Day grows, we find ourselves in a unique moment in time. Suddenly there is a call for women to speak up and share. There is an actual market demand for such content. It is the first time in history that we are seeing this energy in a male-dominated industry and I have no doubt that this is just a beginning for women. From my lips to Hollywood’s ears, I hope that I am right. Angela Stern is a writer and actress. She earned her BFA in theater from U.C. Santa Barbara and began writing plays shortly after graduating. She is the author of five short plays, three full-length plays, and several short films as well as a novel. Angela had the honor of being selected as one of the 30 finalists in the 2016 Samuel French Off Off Broadway Short Play Festival. In August 2016, the show was performed at the East 13th Street Theatre in New York. In October of 2016 her work was a finalist in the Manhattan Rep Short Play Festival and in August 2017 the play went on to the Edinburgh Fringe Festival. Most recently, Angela's full-length play was selected as one of the finalists in the Athena Project's PIP series. Her screenplay for Mama’s Eggnog was recognized as a quarter-finalist in the 2018 Final Draft Screen Writing Competition. She is an independent film critic and contributor to Screenpicks.com. Angela has acted extensively on stage throughout the US and in several independent films as well.